ITU records that there were 979 million fixed-broadband connections by end 2017. Point Topic (2018) estimates the global number of fixed broadband connections slightly lower, at 931.6 million by end 2017. The highest growth quarterly was recorded in Africa, Asia, and Oceania, as these regions with high growth potential continue to embrace new broadband technologies. Nearly three-quarters of net additions in fixed broadband subscribers came from East Asia, driven mainly by growth in China, which is adding some 15m broadband subscribers per quarter. China had already passed a quarter of a billion fixed broadband subscriber milestone in Q1 2016, and continues to grow at impressive speed, adding nearly 70 million FTTH connections over 2017. 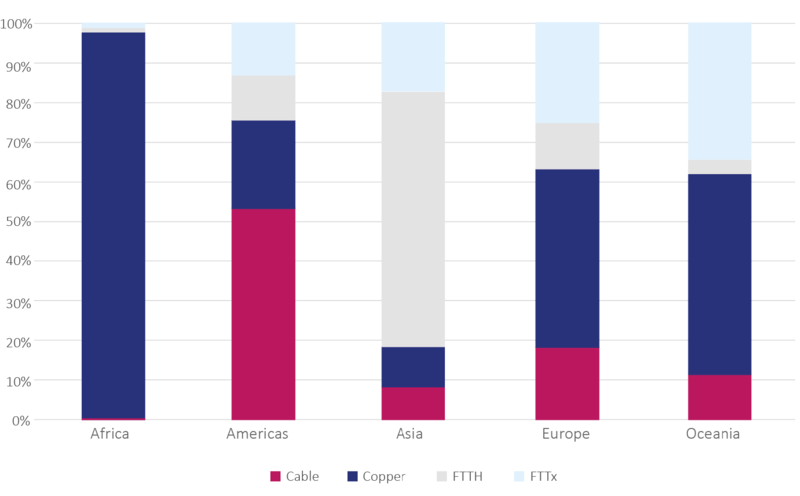 Point Topic reports that, in the year between Q4 2016 and Q4 2017, the number of copper lines fell by 6% globally, while FTTH connections increased by 28%. The share of fibre connections in total fixed broadband subscriptions continued to increase in all regions, with highest growth recorded in Asia and Americas (32). Figure 7 shows the technology market share by region for the global regions for end 2017. Surprisingly, a drop in FTTx lines has been observed since 2016, due to this technology being replaced with FTTH on a large scale in China, and to some extent in other countries. For example, in early 2018, Algérie Telecom announced the commercial launch of FTTH broadband services in several provinces, with the Gigabit-capable direct fibre access network being deployed to the rest of the country through further regional launches expected through the year (33). In the UK, BT’s Openreach’s fibre connections reached a record high of 600,000 at end 2017, with plans to deliver FTTP to 3 million premises by the end of 2020, and 10 million homes and businesses by mid-2020s (34). In Brazil, TIM Brasil launched a 2Gbps FTTH service in October 2017 in Sao Paulo and Rio de Janeiro, passing some 200,000 households at a cost of USD 455 per month (35). In the US, Verizon has stated that their costs to pass a home with fibre have dropped significantly by 2017, down a large amount from USD 700 in 2007 (36). 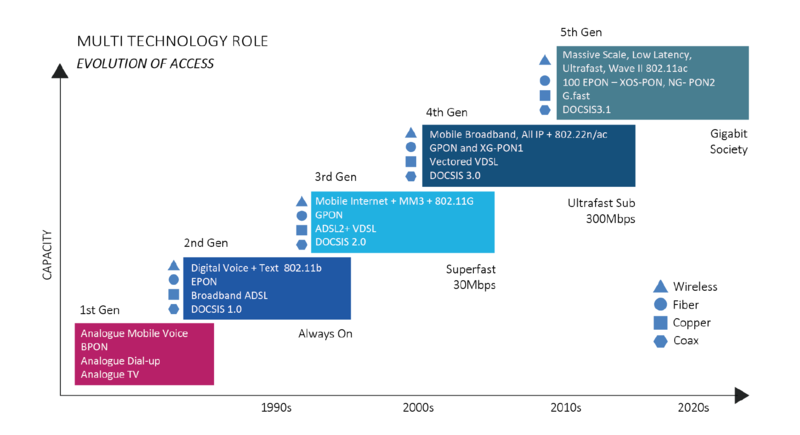 Viewpoint 6 describes the development of broadband in Switzerland. Meanwhile, one of the largest rural fibre connectivity projects in history is underway in India (37). Over 100 million Indians are ready to be connected with fibre, Wi-Fi and LTE. Phase 1 is finished of India's BharatNet. All 250,000 regional councils and 625,000 villages are expected to be reached by GPON fibre by March 2019. Most villages will have local Wi-Fi from the local Post Office and/or a program of local businesses. Backhaul for telcos is included; Indian operators may use BharatNet backhaul as they extend mobile broadband coverage to rural populations. The USD 15 billion project is primarily funded by the Indian Universal Service Fund (USF). Viewpoint 6 describes the development of broadband in Switzerland and the changes in the policy and regulatory environment needed to help stimulate its development. 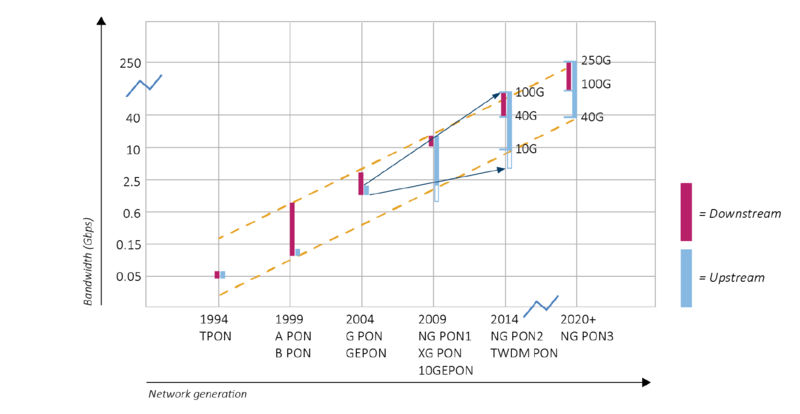 Figure 8 shows the increases in bandwidth and traffic speeds made possible through advances in access networks (top chart) and PON (bottom chart), while Table 2 summarizes the key characteristics of the main xDSL technologies. The development and deployment of ultra-reliable, low-latency and high-capacity networks are essential for future developments in IoT applications (such as autonomous vehicles, which could require huge amounts of data (38)). Viewpoint 7 describes Microsoft’s innovative Project Natick to introduce an underwater data centre. Source: ADTRAN (top chart); ITU (bottom chart). The OECD has defined the IoT as “encompassing all devices and objects whose state can be read or altered via the Internet, with or without the active involvement of individuals. This includes laptops, routers, servers, tablets and smartphones (often considered to form part of the “traditional Internet”), as these devices are integral to operating, reading and analyzing the state of IoT devices” (39). Gartner forecasts that 8.4 billion connected things were in use in 2017, up 31% from 2016, and growing to 20.4 billion by 2020. 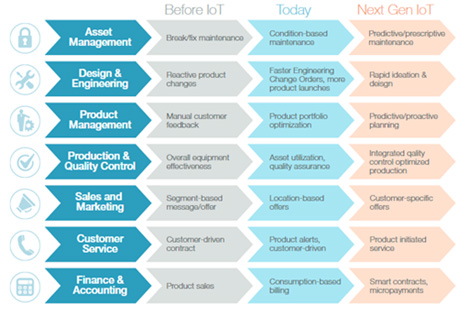 GSMA predictions are more conservative, forecasting that the number of IoT connected devices will increase from 8 billion in 2017 to 13 billion in 2020 to exceed 25 billion in 2025. IDC forecasts are considerably higher, forecasting that some 80 billion IoT devices will be online by 2025, creating 180 Zetabytes of data. According to Ericsson, the number of cellular IoT connections is expected to reach 3.5 billion in 2023, with an annual growth rate of 30%. Of the 3.5 billion cellular IoT connections forecast for 2023, North East Asia is anticipated to account for 2.2 billion (40). In the UK, the regulator OFCOM conducted a study entitled “Review of latest developments in the IoT”, which identified applications with the largest number of connections, examined which technologies are likely to be adopted, and identified critical issues for regulation. It is hoped that this study can give some assurance to operators, prospective licence holders and IoT partners on the views of the regulator. Governments in the Middle East are beginning to look closely at the impact of IoT. For example, in 2017, the Telecommunications Regulatory Commission of Jordan launched a green paper on IoT with the goal of inviting comments from the industry and public at large on many facets of IoT deployment including spectrum, security, addressing, data analytics, permanent roaming, etc. Similarly, in Saudi Arabia, CITC has launched a public consultation to examine the impact of the launch of IoT, virtual network operator licences and issues around IoT. There has been significant recent technological evolution in satellite technologies, which offer broadband capacity across the globe, bringing reliable connectivity to the hardest-to-reach corners of the Earth (41). High-Throughput Satellite (HTS) systems can use multiple spot beams and sophisticated ground infrastructure to provide speed and capacity similar to terrestrial technologies in many cases. Recently deployed and upcoming non-geostationary satellite orbit (NGSO) systems in low-Earth orbits can now provide low-latency connectivity supporting a wide range of applications. 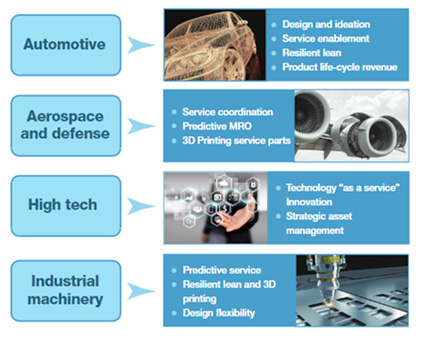 And advances in satellite construction and competitive pressures are reducing the cost of services for users. will continue to improve, while their cost will fall significantly, bringing satellite services in line with terrestrial solutions. In terms of coverage, satellites are an effective means for reaching remote and rural areas, as well as passengers in mobile environments, aircrafts and ships, as well as for use in emergency situations. Integrating satellite connectivity into terrestrial systems can help improve quality of experience (QoE) by intelligently routing traffic with different demands for speed and latency between delivery systems. Satellite technology can also help relieve congestion and overloading of networks. In future, it will support 5G and ensure connectivity in times or areas where terrestrial networks are unavailable. Lower frequency band satellite services are ideal for high-reliability and mobility applications, including safety services. Satellite systems should be given consideration as complementary solutions for next-generation broadband network deployments in rural and remote areas, as well as in diverse environments and deployment scenarios. Viewpoint 9 considers how partnerships can be used to advance satellite connectivity, while Viewpoint 10 explores the role of Governments in promoting connectivity using satellite broadband. “We Are Social Internet report”, January 2018, available at https://wearesocial.com/blog/2018/01/global-digital-report-2018 based on data from Global Web Index. “ICT4D Report 2018: Data-Driven Development”, World Bank, Washington, forthcoming. “The Global Smartphone Report: The forces behind the global deceleration in smartphone sales”, Business Intelligence, 29 March 2016. World Investment Report 2017, UNCTAD, Geneva. Cisco Virtual Networking Index 2017. 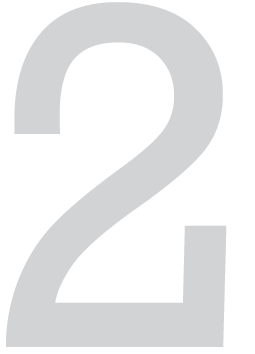 Chapter 2, “Data-Driven Development”, Global ICT4D report, World Bank, forthcoming. Due to the higher concentration of traffic (measured in traffic load per square kilometer) and the use of higher spectrum bands above 3 Gigahertz. Report of an Expert Group presented to the Broadband Commission, “A New Deal: Investing in Our Common Future”, 2018.